Builders Hoist Rentals Are you looking for any Builders Hoist Rentals In Chennai.We are one of the Best Builders Hoist Rentals In Chennai.Kindly call us for more information and services. Builders Hoist Are you looking for any Builders Hoist Rentals.We are one of the Best Rental Service for Builders Hoist.Kindly call us for more information regarding the rental service and price. Builders Hoist: Builders Hoist for a rental service. Jump to Construction - Also known as a Man-Lift, Buckhoist, temporary elevator, builder hoist, passenger hoist or construction elevator, this type of hoist is commonly used on large scale construction projects, such as high-rise buildings or major hospitals. BUIDER HOIST: Are you looking for any Builders Hoist Rentals.We are one of the Best Rental Service for Builders Hoist.A hoist is a device used for lifting or lowering a load by means of a drum or lift-wheel around.Also known as a Man-Lift, Buckhoist, temporary elevator, builder hoist, passenger hoist or construction elevator.Kindly call us for more information regarding the rental service and price. RENTAL SERVICES Are you looking for any rental services for centering materials in chennai and coimbatore. we are one of the best centering materials in chennai and coimbatore . we are provider column box /column shoes/ props/centering sheet/spans/ builders hoist/ scaffolding materials/concrete mixer machine/sand seiver/Earth rammer. 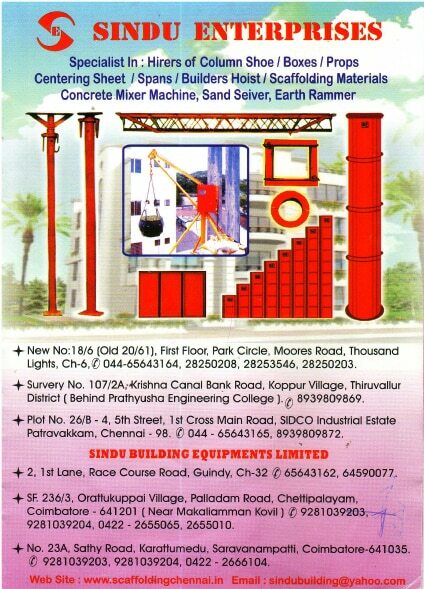 so kindly call us for more information regarding the products and its best offer price for rental in chennai and coimbatore.